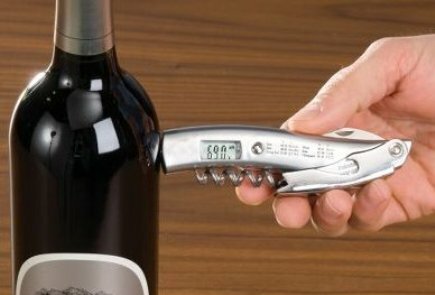 Wanna serve the great tasting wine at optimal temperature? This is a stylish and cool gadget which combines corkscrew with an infrared wine thermometer to let you see the temperature of your beloved wine before the bottle is open. As what you see in the photo, the built-in infrared sensor can reads the wine’s temperature in a second by a simple step, just simply place the corkscrew’s curved handle against the outside of the bottle. After that, the result of wine’s temperature will display on an illuminated screen to allow you to serve vintages at their optimal temperature. The infrared wine thermometer which costs about $130 is really a cool gadget for you to be a wine expert!